With many species of Orchids available for sale in Orchid Flasks, this is one of the cheapest ways of buying cloned orchids. Available from specialist growers in Australia, an ever increasing variety of orchids can be purchased in flasks. Basically seedling, cloned orchids in a sterile jar. Orchid Flasks are a way of sending orchids both within Australia as well as from one country to another in a sterile medium. This meets the quarantine requirements of many countries and is also the cheapest way to buy orchids. 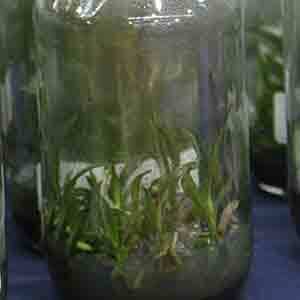 Orchid flasks are used as means of cloning or propagating orchids by tissue culture. Cymbidium flasks are one of the most popular, however a wide range of other orchids are also available in flasks. Cell propagated orchids (Tissue Culture) are an economical way to purchase cloned orchid plants. These plants are supplied from the grower in ‘Glass Flasks’. Australian Orchid Flask suppliers can provide a wide range of orchids in flasks including Australian orchids. Many species of orchids are readily available for sale online in Australia. Can you import Orchid Flasks from Overseas ? Thinking of importing Orchid Flasks into Australia from overseas. At last look, you can bring orchid flasks back from overseas as long as you conform to the AQUIS requirements. The grower must provide botanical names and a certificate that says they conform to CITES requirements. A limit is imposed on how many flask a hobbyist can bring back. We suggest you contact AQUIS before importing any plants. Deflasking Orchids does require some skill. Flasks once received should be allowed to acclimatise and harden up before de-flasking. seedlings can be removed by gently washing them out of the flask or by carefully breaking the flask. Orchids in Flasks are available for sale form the following participating nurseries.